Cotton Candy, Snow Cones, Popcorn and more! 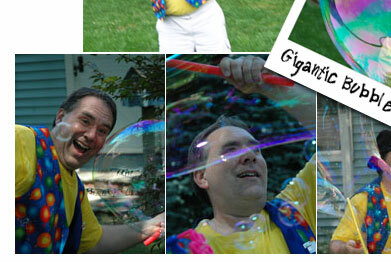 Gigantic Bubble Parties for kids of all ages. Want something a little different? How about a bubble birthday party? If you are in CT or Port Chester, NY you are in a for a big bubble surprise. 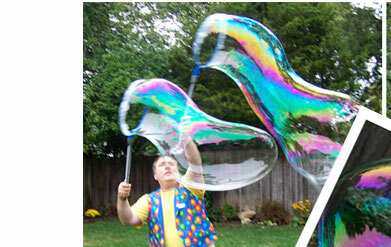 Big bubbles, huge bubble wands, great bubble toys, and bubbling bubble fun for the best bubble party ever! Kids from all over CT - Darien, New Canaan, Wilton, Greenwich and beyond will get to make bubbles bigger then they are and see thousands of bubbles in the air of all different sizes. The kids from Danbury will cheer so loud that the kids from Westport might even look up and be surprised. From Norwalk to Milford and all over Fairfield county, Mr.Bungles' bubble parties will make your birthday party or event the best ever. After Mr. Bungles demonstrates how to make the incredible bubbles, all the kids will get to try all different kinds of bubble toys and bubble wands and will smile and cheer as they experience hands on a really fun bubble birthday blast. 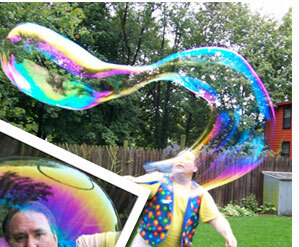 Now you can laugh at the comedy show of Mr. Bungles and get to explore a world of bubbles too. 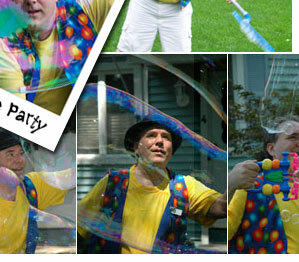 The bubble station can be set up for a small backyard party or for a major event with thousands of people. The bubble area includes fun toys that shoot out hundreds of bubbles a minute, wands of all sizes to create HUGE bubbles, and lots of smiles. A stronger homemade bubble fluid is used that allows bubbles to be 10 feet long! It is so much fun that the kids and adults take turns becoming master bubblers. For large events, the bubble station can be arranged and staffed to handle up to 300 people an hour. Call Party Talent, LLC for the best bubble party ever. You can add bubble fun to any party or have an outdoor event day that includes bubbles, parachute games and more. A really neat option that the kids really enjoy. 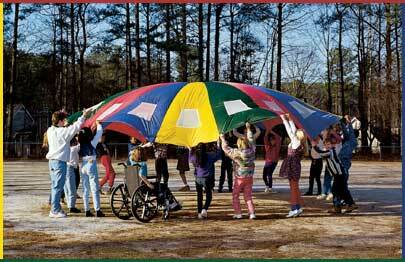 Imagine 15-50 people all playing on top of, underneath and all around a parachute as everyone creates fun waves and play all kinds of games invented just for the parachute. The 20 or 24 foot parachute used has large heavy duty mesh portholes and is extremely durable while providing clear visibility from inside or out. Get ready to shake it up and have some fun! Want something a little different? How about a Karaoke party? Kids get to sing their hearts out and have a blast choosing from thousands of classic songs that they know and love. If your child enjoys singing, this is a wonderful option. All the kids have a great time with karaoke games and contests and become the "star of the day" as they sing and have fun. The Karaoke Party is perfect for the child who would rather sing privately with groups of friends then in a public place and for the aspiring performer who loves being on stage and is ready to belt out a solo. Get ready to rock the house with music, contests, fun, prizes and Karaoke fun! Everyone loves the balloon sculptures. From monkeys on palm trees, aliens, and Spider Man, to flowers with hearts, every kid wants a super hero, animal, flower or special hat. Even though the kids enjoy seeing a few being made they also all prefer to just be next! A wonderful option recommended for any party of 8 or more is to pre-make most of the balloons before the party begins. This allows the performer to have more comedy time and less waiting time. Pre-making the balloons can be used as a "goody bag gift" and allows a few extra minutes to make a special creation just for the guest of honor without the others being bored or distracted. "You know you had a great party when children don't want to go home! 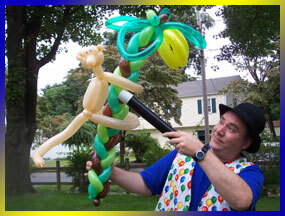 Mr. Bungles was great & the original balloons he brought were well worth the extra $$." For more balloon photos click here. "You were perfect for our party - The kids had a great time - they were all entertained and well behaved. Having the balloons done in advance was great!" Multiple performers are available for any event including face painters, caricature artists, magicians, DJ's, costumed characters and more. Party Talent, LLC often coordinates, grand openings, catered events and arranges a variety of skilled professionals for all occasions. You can also book cotton candy, snow cones, pretzels, & hot dogs. One call will do it all!